Ding-dong! Dead-dong! Class is about to begin, and you don't want to be late on your first day of school! Join Tsugumi Harudori in the "NOT" class at Death Weapon Meister Academy, a school dedicated to training transforming weapons like Tsugumi and the meisters who will wield them. Many "NOT" (Normally Overcome Target) students aspire to join the elite "EAT" (Especially Advantaged Talent) class. But it may take Tsugumi some time to find her confidence—and a partner—at this crazy school! Soul Eater NOT! was published in English by Yen Press from July 24, 2012 to July 21, 2015, as well as in eBook format from April 8, 2014 to July 21, 2015. First of all, if you are reading this and haven't checked out the original Soul Eater yet, then I recommend that you stop right there and check out the original Soul Eater first. Why do I say that when Soul Eater Not is a spinoff and not a sequel? 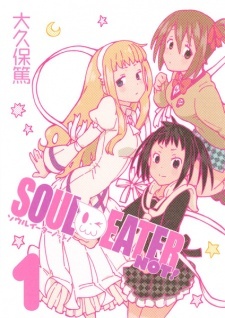 Because Soul Eater Not is everything that Soul Eater could have been, but was unable to capitalize on due to focus on plot: a school life/slice of life comedy. Have you ever wondered what the daily lives of Shibusen students would look like? Well I personally haven't because Soul Eater was sufficiently awesome, but Ookubo Atsushi disagreed with me and created this. Technically a prequel to the original Soul Eater, Soul Eater Not seems like a slower pace, more comedy/character centralized manga with less focus on plot and more focus on the daily lives of Shibusen students. It takes place long before the Kishin shows up when Medusa is still the school nurse and Sid is still human. It can be seen as background information, explaining details like "Where does Maka and Soul get the money to support themselves?" and "Where does Kim live?" There is a slight continuity issue them mentioning Kim is a witch, but that can be taken out of context. The story follows a new character, Halberd Tsumugi (Yes her family name is Halberd, the bane of cavalry,) who is a new student at Shibusen and has to become accommodated to Death City. Since we were introduced to Maka and her merry band of friends when they were already well on their way to becoming full-fledged Meisters and Weapons, Soul Eater Not provides new insight into life at Death City by starting the process from scratch. It seems to be written at a much slower and more relaxed pace than the original Soul Eater, and takes place earlier than its parent story, during times that were much more peaceful and mundane for Death City. The characters of Soul Eater Not are just as varied and unique as our mains in the parent story. Our main protagonist Halberd Tsumugi, is a meek, shy weapon girl who attends Shibusen yearning for a school life surrounded by bishounen. She quickly meets two meisters: Anya Hapburn, our resident type-A tsundere Ojou-sama that should be voiced by Kugimiya Rie, and Tatane Meme, our resident big-breasted klutz who may have a few secrets she has yet to share. Both of them want to become her partner, and the story has not progressed far enough to indicate the nature of this conflict. Soul Eater fans can be relieved by that the design and artwork is completely up to par with the original Soul Eater. For those of you who don't know what that means (go read Soul Eater already), Ookubo Atsushi uses rather abstract and warped and wicked artwork. The recurring visual themes include faces on inanimate objects, skulls, eyes, and other gothic themes. The backgrounds and buildings are always awesome to look at, which are styled with a sort of wicked Halloween sort of theme. Where Ookubo Atsushi's talent really shine is his ability to draw faces, especially contorted faces twisting with agony. He can draw a myriad of different expressions that are quite different from the generic Japanese moe faces like >_< or ^_^. Overall, Soul Eater Not is a good manga to try if you have read the original story. In my personal opinion, I think Oobkubo Atushi got a little bored or stuck while writing the original Soul Eater, and began publishing this just for a change of pace. Questions, comments, criticisms and compliments are welcomed whether you found this review helpful or not. Soul Eater Not! is exactly as the title says. it is NOT Soul Eater. But that isn't to say it is terrible, however I definitely prefer the original story and the original characters. In this manga, there is a girl named Tsugumi Harudori (Halberd) who has traveled from japan to DMWA "Death Weapon Meister Academy" to become a student there. Sad to say, this isn't focused on the lovable characters from Soul Eater, however we do see the majority of the original characters hanging around the school and most of them interact with Tsugumi in some way for a few brief moments. The beginning of this chapter made me want to fall asleep, to be honest. I wasn't interested in this new character and nothing exciting was standing out to me. But as the chapter progressed it did get more interesting and by the end I was willing to read another chapter. I wasn't "hooked" by some epic event that took place or anything like that, but I am interested to see how things will progress with these new characters. You also learn more about Shibusen School. Chapter one (Instantly hooked!) The EAT and NOT classes clever puns. The characters and their personalities make the storyline so far as they are still slowly building up, eventually I know though soon Atushi Okubo is definitely going to make these characters cross paths with the Soul Eater's current storyline which I look forward to. Or possibly they have met already and they're just implying it? Hehe a theory I have the reason for this spin-off is that later on Halberd will also have a big involvement in the Kishin war. Can I start reading NOT without Soul Eater?